Jimmy Page has said that strangers often stop him on the street and beg him to reunite Led Zeppelin. 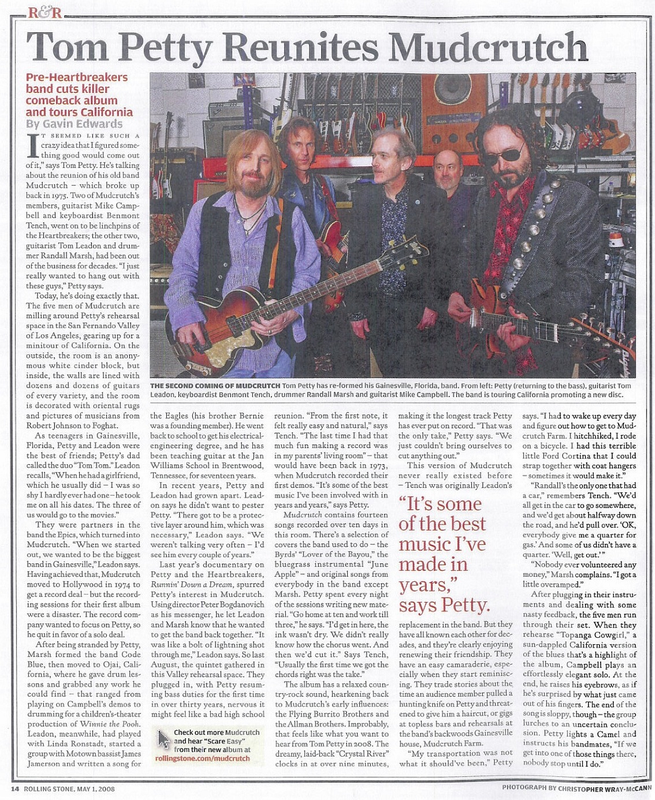 It's possible not a single person alive has ever asked Tom Petty to reunite his pre-Heartbreakers band Mudcrutch, but he's doing it anyway. 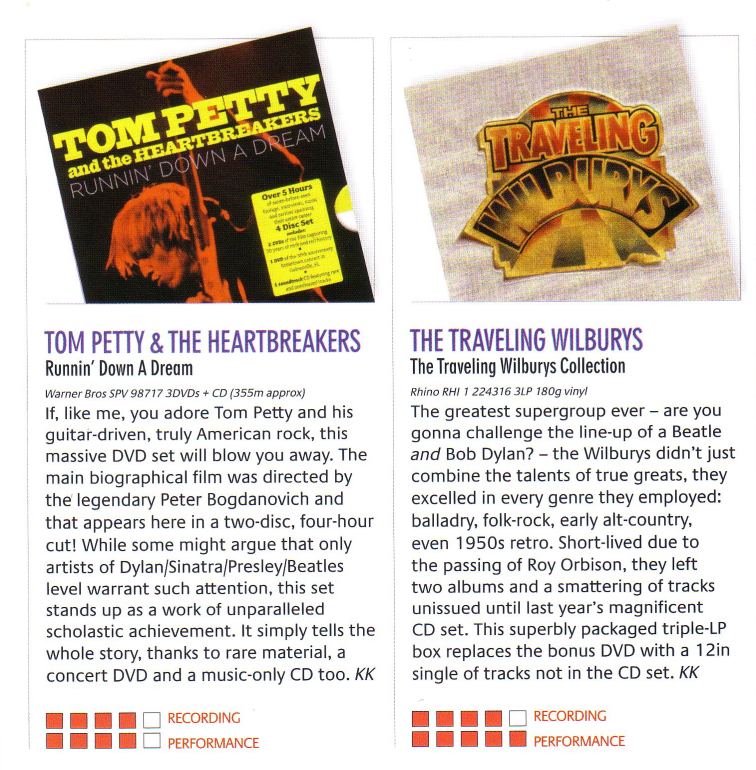 The group -- which included future Heartbreakers Benmont Tench and Mike Campbell, along with drummer Randall Marsh and guitarist Tom Leadon -- broke up in the mid-Seventies and hadn't played together until earlier this year when Petty called them all to his Malibu house to cut a new album. He's even mulling a tour next year. 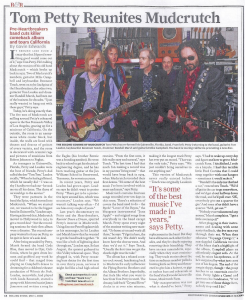 Keep reading for a Q&A where Petty explains why he got the old crew together again. There exists in sound a map of Los Angeles, filled with song-lyric street names, neighborhoods, beaches, bars, empty spaces and spaces between spaces. 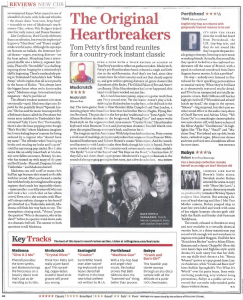 It's a chart that follows more than 30 years in the life and work of Tom Petty, a longtime resident of the city and an undercelebrated rock & roll icon who finally appears to be getting his due. In 1974, Petty drove cross-country from Gainesville, Florida, to Los Angeles to get a record contract. Knocking on doors along Sunset, he played demos and eventually got a deal for his first band, Mudcrutch, then moved the group to L.A. "We fell in love with L.A. within an hour of being there," Petty told author Paul Zollo in the 2005 book Conversations With Tom Petty (CWTP). "We just thought this is heaven. We said, 'Look — everywhere there's people making a living playing music. This is the place.'" 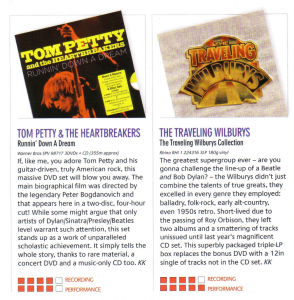 In 1976, the first Tom Petty and the Heartbreakers album hit, and aside from touring with the band, he's never left town. His songs are indelibly linked with the cityscape, sometimes explicitly but more often in hints — that rare ability of a gifted lyricist to generalize the intimate. Have you ever wondered what gives music the ability to age gracefully without sounding dated? An obvious answer is "good songwriting," but it goes beyond that. A good song recorded with the help of the latest technology 'advances' will age a song before its time, and pin it to a specific decade. A few examples of these technologies include the Linn drum machine and the Fairlight synthesizer, which gained prominence in the 1980s. Guitar trends that prematurely dated a song include the reliance on a prominent effect such as chorus, or the two-hand approach to guitar playing first popularized by Eddie Van Halen. By the end of the decade, both of these had become as commonplace in modern music as big hair, spandex, and cocaine abuse. Certain music stands the test of time because of melody and composition and within rock and roll music, longevity is measured by decades, not centuries. While highly subjective, it is easy to see why The Beatles music (the newest of which by next year will be 40 years old) is considered great and has stood the test of time. It has melody, rhythm, great arrangement and interesting "parts," played mostly within the context of a three minute song. "This is a trip, isn't it?" Tom Petty rhetorically asked a smallish Malibu audience last Saturday night, pointing out that he and the musicians on stage with him were playing "our first show together in 35 years." If you've guessed that Petty couldn't have been talking about the Heartbreakers — based on your vague memories of seeing the halftime show before you passed out at your last Super Bowl party — then you'd be right: The group making this live comeback was Mudcrutch, the Gainesville, Fla., band that existed in various permutations from 1970-75 before evolving into the Heartbreakers. "It seemed like such a crazy idea that I figured something good would come out of it," says Tom Petty. He's talking about the reunion of his old band Mudcrutch -- which broke up back in 1975. Two of Mudcrutch's members, guitarist Mike Campbell and keyboardist Benmont Tench, went on to be linchpins of the Heartbreakers; the other two, guitarist Tom Leadon and drummer Randall Marsh, had been out of the business for decades. "I just really wanted to hang out with these guys," Petty says. Today, he's doing exactly that. The five men of Mudcrutch are milling around Petty's rehearsal space in the San Fernando Valley of Los Angeles, gearing up for a minitour of California. On the outside, the room is an anonymous white cinder block, but inside, the walls are lined with dozens and dozens of guitars of every variety, and the room is decorated with oriental rugs and pictures of musicians from Robert Johnson to Foghat. As teenagers in Gainesville, Florida, Petty and Leadon were the best of friends; Petty's dad called the duo "Tom Tom." Leadon recalls, "When he had a girlfriend, which he usually did -- I was so shy I hardly ever had one -- he took me on all his dates. The three of us would go to the movies."